Claromentis are recognised as one of the UK's top 25 SME culture leaders by renowned SME journal Real Business. 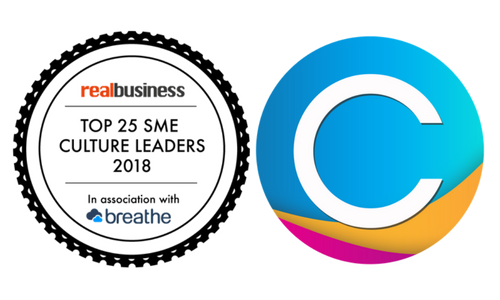 BRIGHTON, England, July 13, 2018	(Newswire.com) - Digital workplace and intranet software provider, Claromentis, have been named 2018's "Top 25 SME Culture Leaders" by Real Business. Claromentis "stood out to the judges as exemplifying commitment, vision, and passion towards building and driving a strong and inclusive company culture", said Real Business. This marks an outstanding achievement for Claromentis, who have consistently championed company culture for their staff and clients alike. For Claromentis, the biggest driver behind being able to deliver what is now award-winning company culture, is by using their own digital workplace software. It empowers Claromentis staff and their customers to work flexibly, remotely, and autonomously. Instant messaging, social feeds, documents, and news are all available in real-time, in the same place, and accessible from any location. The Claromentis mission is to provide an "integrated digital workplace that helps companies share information, work smarter, and engage with people to reach their goals." Their latest award from Real Business reflects just how meaningful and relevant their mission is. To learn more about the Claromentis digital workplace, try their software for free today. For further information, visit www.claromentis.com. Founded in 1998 with headquarters in the UK, Claromentis have 20 years of intranet and digital workplace experience under their belts. Deploying a new digital workplace every week, Claromentis provide their software to global customers of all scopes and sizes, such as Virgin Care, NHS, Guinness World Records, Serious Fun Children's Network, and Golden State Warriors.